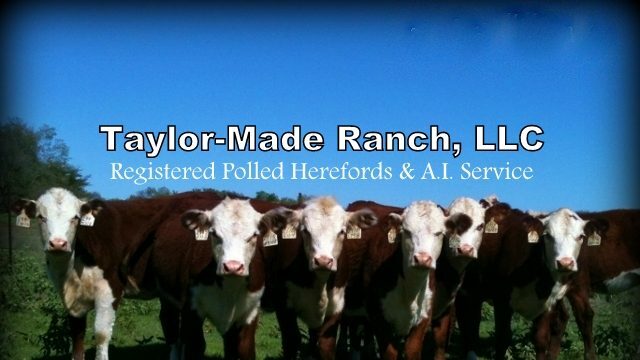 We are offering for sale several calves that have been weaned and vaccinated with both BarVac 7/Somubac as well as ViraShield 6 + VL5 and have been poured as part of our rigorous herd-health program. They’ve received their boosters and are now ready to be offered to you. These calves are all registered with the American Hereford Association. Please understand these animals are offered only on a first-come, first-served basis. We will be weaning & adding other registered Hereford calves soon. But at that time currently-listed calves will age-up in price. Don’t delay – get them now! 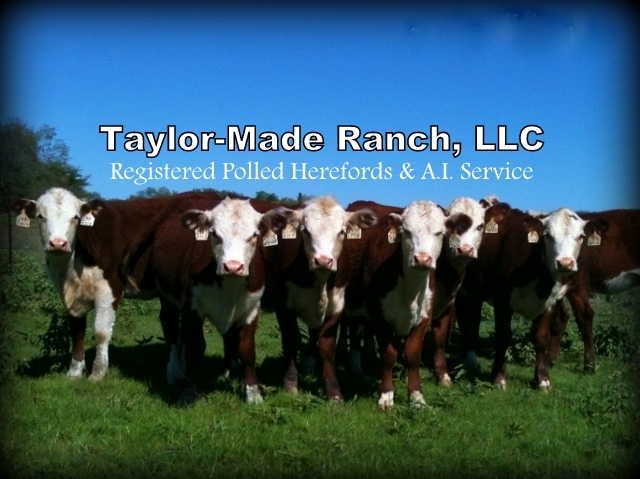 Here is our current registered Polled Hereford herd sire at Taylor-Made Ranch. The results are in and our cows have been bred! 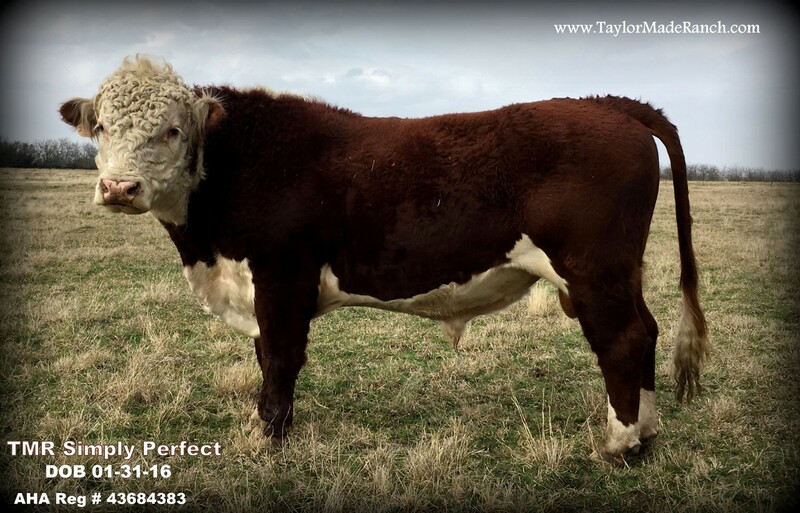 We’re keeping some of his gorgeous heifers so we’re offering this young, proven stud-muffin bull to you. We love his super-dark coat and the pigment around his eyes. And we’ve never had to pull one of his calves. The dams deliver fine on their own without help from you! He’s the A.I. product of one of our most productive cows. And his A.I. sire Perfect Timing has some pretty impressive stats ranking very highly in calving ease, birth weights and more! This herd bull is young and ready to work, and he loves his job! We’ve been pleased with the moderate size of his calves. 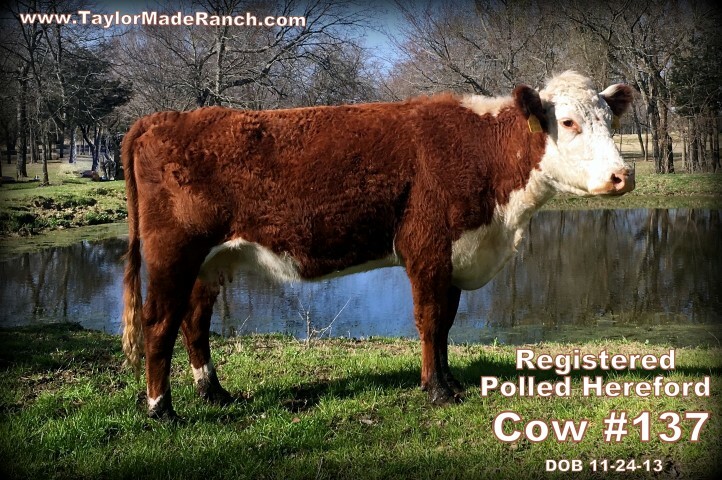 If you’re looking to add a quality bull for your own herd, don’t let this one pass you by! 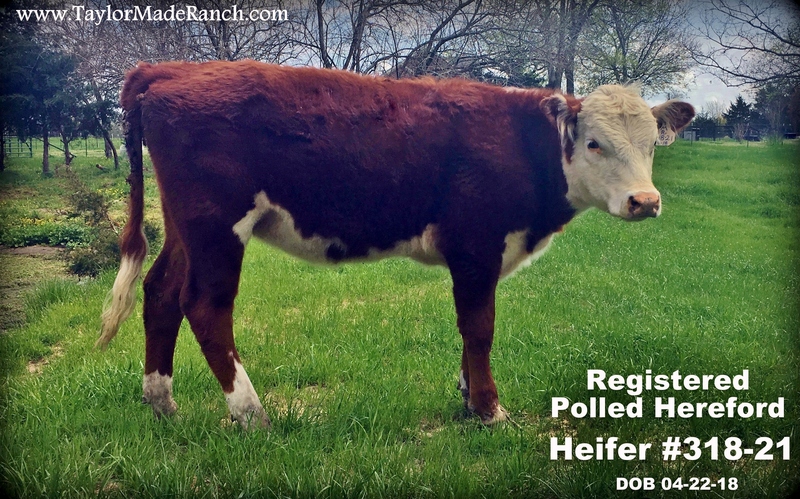 BRED Registered Polled Hereford Cow #137 – This girl is young, just barely 5 years old. And she’s also lab-confirmed bred to calve a registrable calf in August. Don’t miss out on this one! 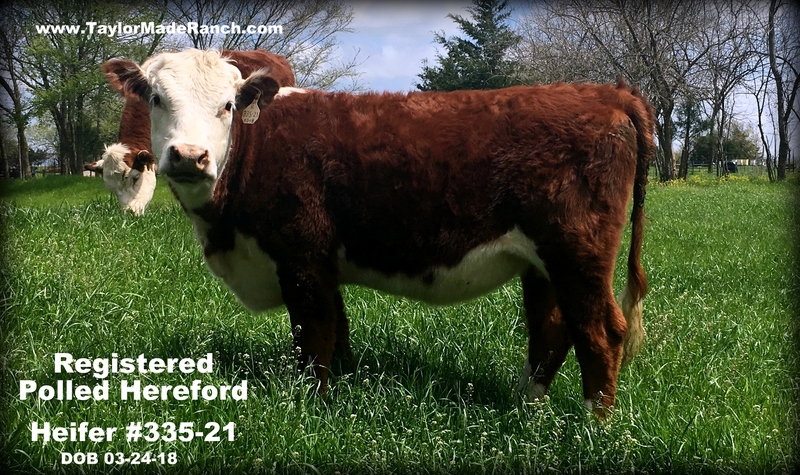 She’s already registered with the American Hereford Association and her registration will be transferred to your name at no charge when you purchase her. She’s calm & current on all annual vaccinations, being immunized on 03-08-19 with both Bar-Vac 7/Somnus as well as Virashield 6 + VL5. She was also wormed with injectable Noromectin. Heifer Yearling #318-21 – This sweet heifer was born right here on our ranch on 04-22-18. She is her dam’s first calf so she’s nice & small. Her sire is our calving-ease herd bull Sire: REG #43684383 TMR Simply Perfect 207 (A.I. son of HH Perfect Timing) She’s already registered with the American Hereford Association and has received her ear tattoo. She’s weaned, calm & current on all annual vaccinations, being immunized on 09-17-18 with both Bar-Vac 7/Somnus as well as Virashield 6 + VL5 & poured with Cydectin. Her boosters were administered 11-02-18. Heifer Yearling #335-21 – This sweet heifer was born right here on our ranch on 03-24-18. She is her dam’s first calf. Her sire is our calving-ease herd bull Sire: REG # 43684383 TMR Simply Perfect 207 (A.I. son of HH Perfect Timing) She’s already registered with the American Hereford Association. She’s weaned, calm & current on all annual vaccinations, being immunized on 09-17-18 with both Bar-Vac 7/Somnus as well as Virashield 6 + VL5 & poured with Cydectin. Her boosters were administered 11-02-18. All sales are cash only. Local cattle delivery is available for $2.50 per loaded mile within a maximum 75-mile radius ($25 minimum). 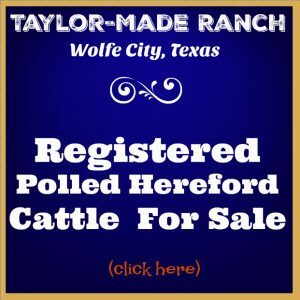 We’re located in Wolfe City, northeast of Dallas and just 15 miles north of Greenville TX, 10 miles west of Commerce TX, or 45 miles east of McKinney TX. Also close to Honey Grove, Ladonia and Bonham. If you’re interested in any of these animals please contact us via email or by calling Stacy’s cell at (903) 453-1875. 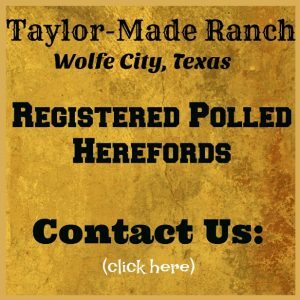 This is our current registered Polled Hereford herd sire at Taylor-Made Ranch. He’s the A.I. product of one of our most productive cows in the herd and A.I. sire Perfect Timing – who has some pretty impressive stats ranking very highly in calving ease, birth weights and more! This herd bull is still young but we’ve been pleased with the moderate size of his calves. Plus, you know, they’re all absolutely BEAUTIFUL! 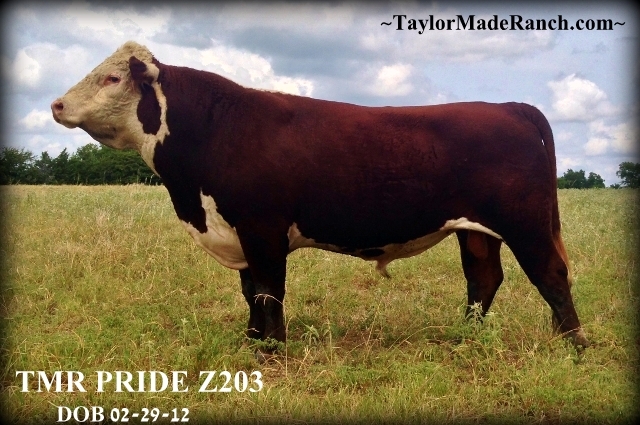 This registered polled hereford bull is named TMR Pride for a reason! He was born right here on our ranch. He’s the A.I. product of one of our most productive cows in the herd and A.I. Sire Huth Prospector – who ranks high on 6 major traits and is a trait leader for ww, yw, is also strong maternal sire setting high standards for milk m&g. Huth Prospector is the trait leader for marbling & the CHB$ index.